Feliz Día de los Reyes! Happy Kings’ Day! The first time I heard of today’s holiday was way back in elementary school when one year the Reyes decided to make the trip all the way up to snowy Michigan to leave my sister and I Precious Moments dolls. I remember my mom telling us that in the Hispanic world it’s a very special day with presents for the kids. I was sold. Unfortunately, the reyes never returned to Michigan, so I had to wait until a trip to Mexico to celebrate Reyes again. A friend invited me to share a meal and the Rosca de Reyes sweet bread with his family. Although there were no gifts involved, the special cake with the little baby Jesus tucked somewhere inside was pretty fun. But, Reyes really came to life when I moved to Spain. My first year in Santiago de Compostela I was out and about in the city on the evening of January 5th, when suddenly the streets were filled with kids and the shop owners started checking their watches-everyone was waiting for the three kings to make their big entrance into town. The parade that ensued involved very excited kids, loads of candy thrown into the streets, and the magic post man who delivers the kids letters to the Kings. Total culture shock for me. When did these guy become more popular than Santa?! The morning of January 6th the streets were alive with kids on scooters and bikes, laughing with gusto while enjoying their new toys. This year we’ve made our way back to France just after the new year, returning to the real world abruptly with the first days back full day of classes. 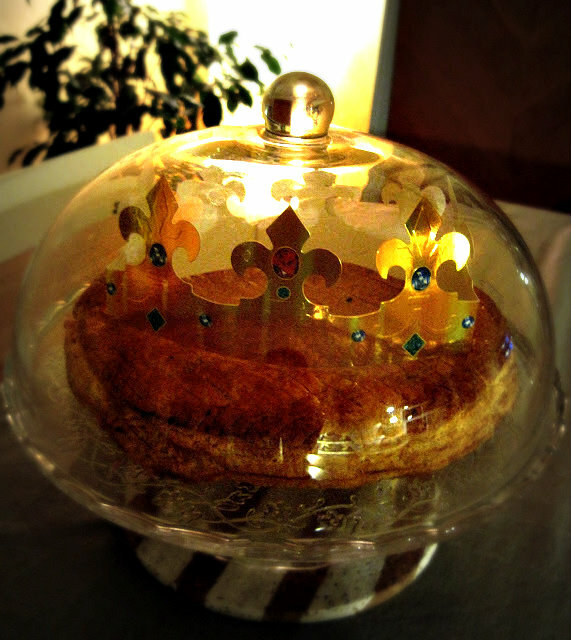 But, the kings did make a special early stop at our place with a little pressie for me and one for Diego too, and all the bakeries are selling their gorgeous Galette des Rois (King’s Tart) complete with a crown. Although in France there are no presents and no King parades in the streets, the galette is a sweet way to remember the epiphany. 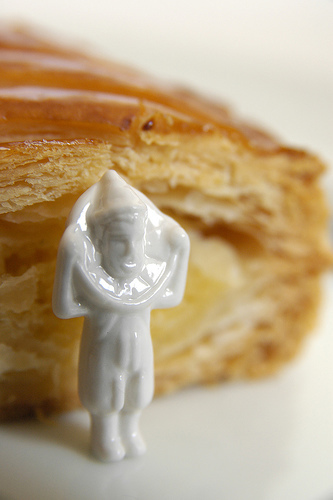 The galette des rois is a sweet tart traditionally filled with an almond paste called frangipane, made extra special because tucked somewhere between its sweet layers is a little porcelain fève (usually a little toy, they had the cutest little Tintin and Hobbit fèves at Carrefour). When serving the galette, the youngest in the family is given the job of deciding who gets each piece-from under the table with eyes closed so there is no cheating! If the fève is in your piece, the crown is yours and you are the king or queen for the day. Families and friends will be celebrating all this week, and even all this month. We’ll be sure to share galette to share with friends this week as a welcome back after the holidays. Who’ll get the fève? 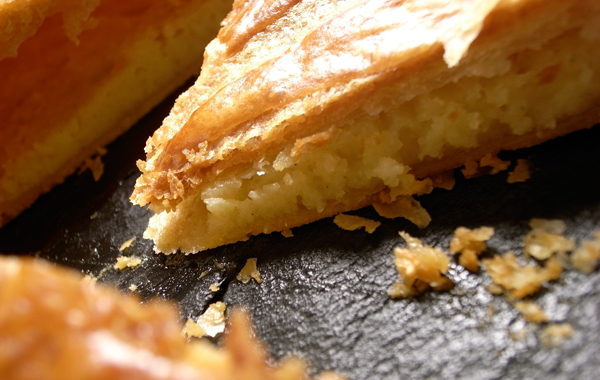 Try making a a Galette des rois with this recipe, or a Rosca de Reyes from the Hispanic tradition here.